PHEW!!!!! 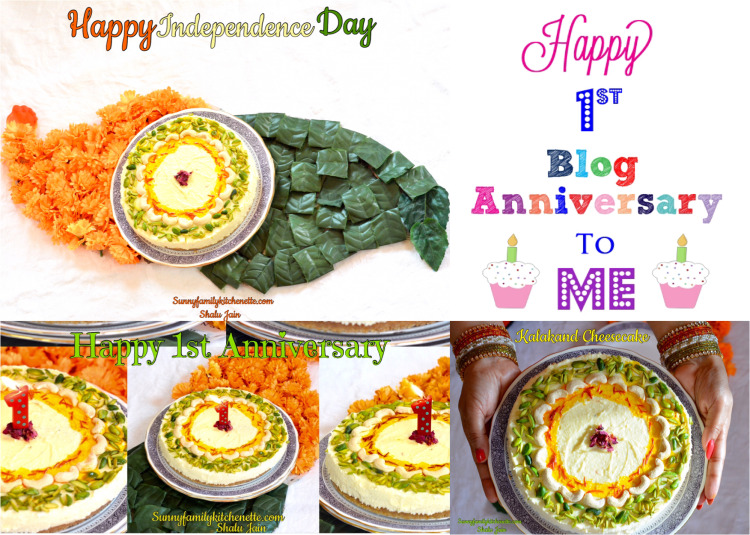 Just cant believe that I am writing this post for my Blog's Anniversary-BLOGOVERSARY. Time flies so fast. 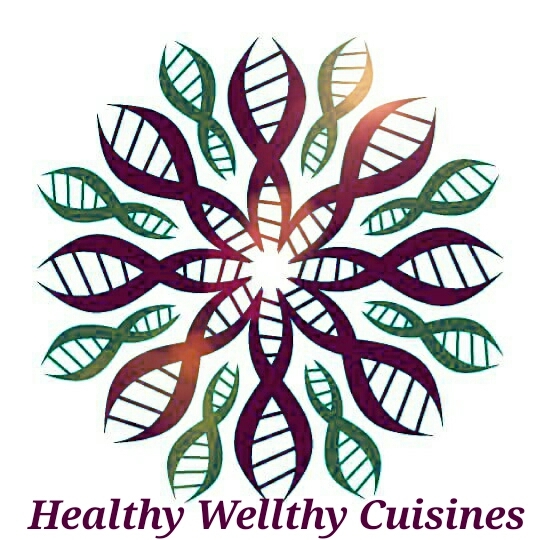 It seems it was just yesterday when my family and friends were coaxing me into starting a blog so that they can see all my recipes at one place. Though having my own blog was my dream but the shy and hesitant me was giving one or the other reason to avoid it. And now this day has one more reason to make it all the more special- blogoversary. Celebrations and sweets go hand in hand. 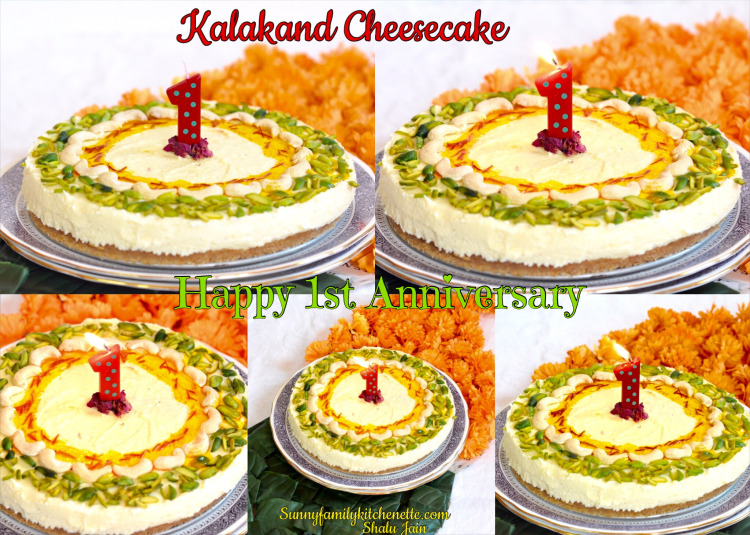 To celebrate this special occasion I wanted to make something easy,simple yet special and full of flavors. 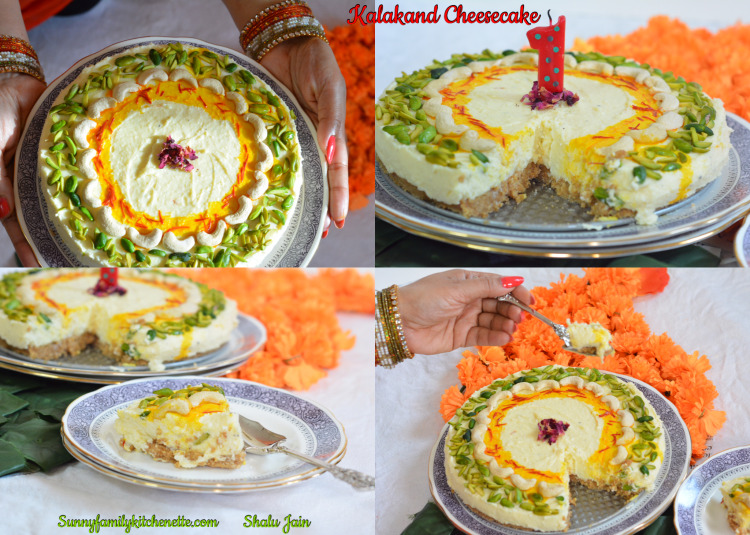 After too much of thinking I zeroed in on trying something new- KALAKAND CHEESECAKE. Something which is Indian yet very contemporary. Something which is "Videshi mein desi tadka". This dish just surpassed all my expectations and came out brilliant in terms of taste and flavors. 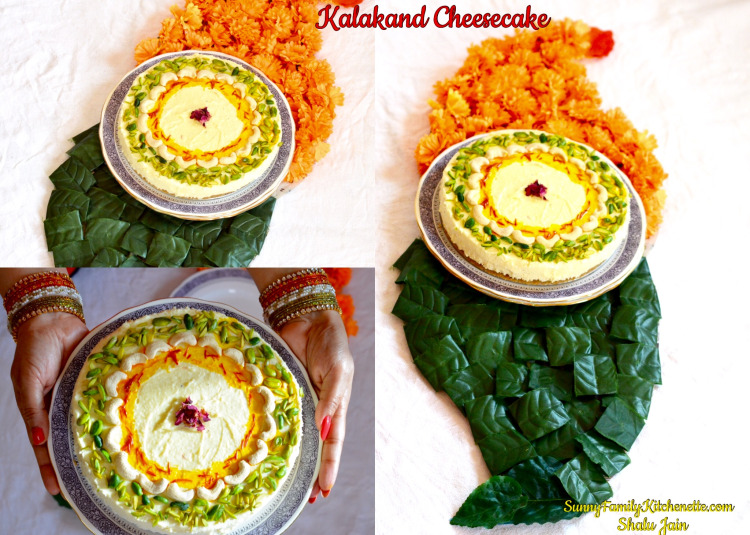 It has Indian sweet flavors of Kalakand which gels very well and balances with the sourness of cream cheese. 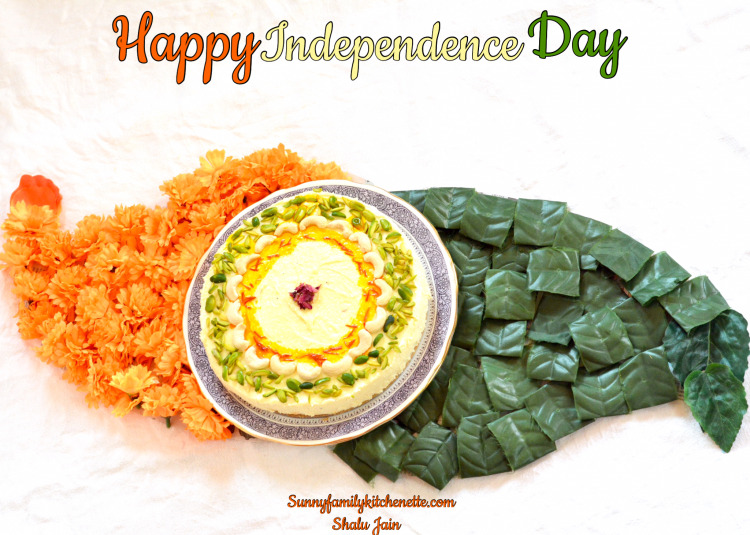 Lets start the celebrations by making this yummmmm desert. But first lets gather all the ingredients required. 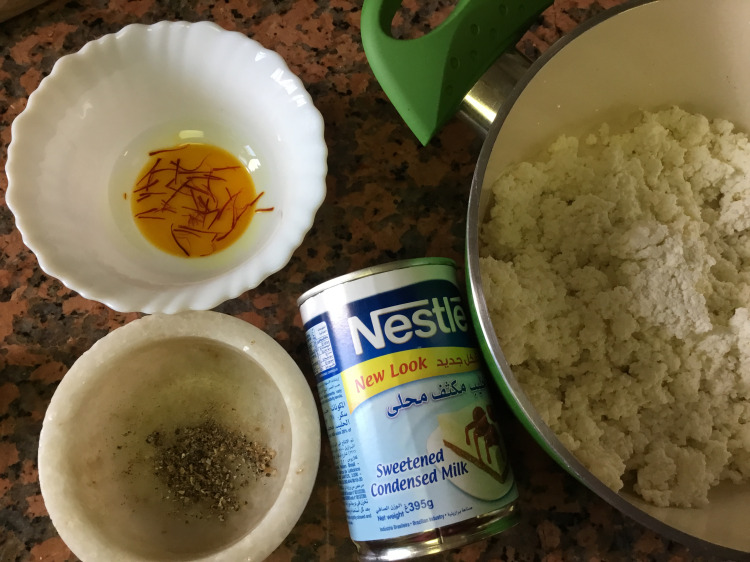 Saffron- few strands dissolved in 1 tablespoon of warm Milk. Pista, Cashew slivers to garnish. We will start by making paneer. 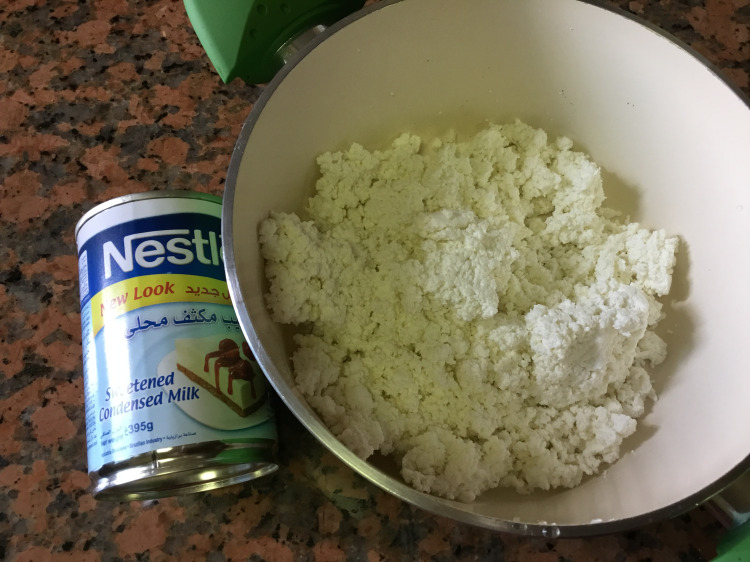 For this add 2 liter milk in a pan and start boiling. When it comes to a boil, switch off the gas. Add 3tablespoon vinegar to it. Milk will start curdling. 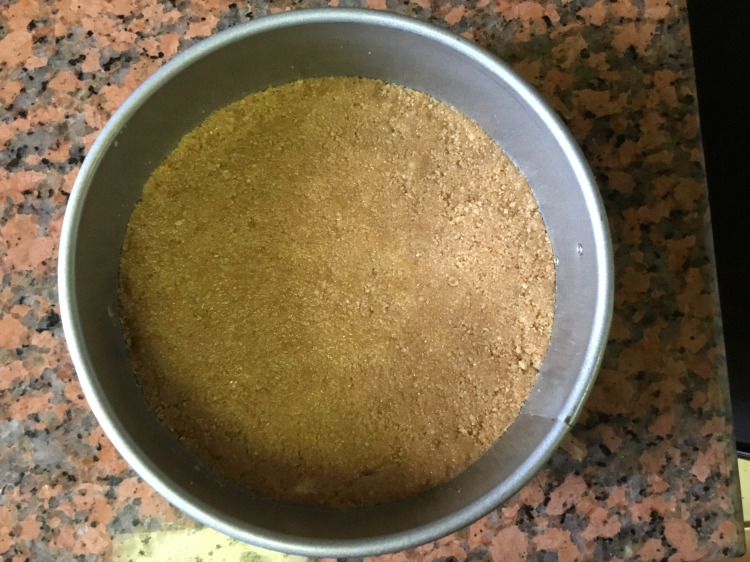 Strain this curdled mix through a fine sieve or muslin cloth. Whey will be separated from paneer. Wash thoroughly with fresh water to remove the sourness. Drain the water by squeezing the cheesecloth. Knot the muslin cloth and hang it to get rid for any excess whey/liquid. 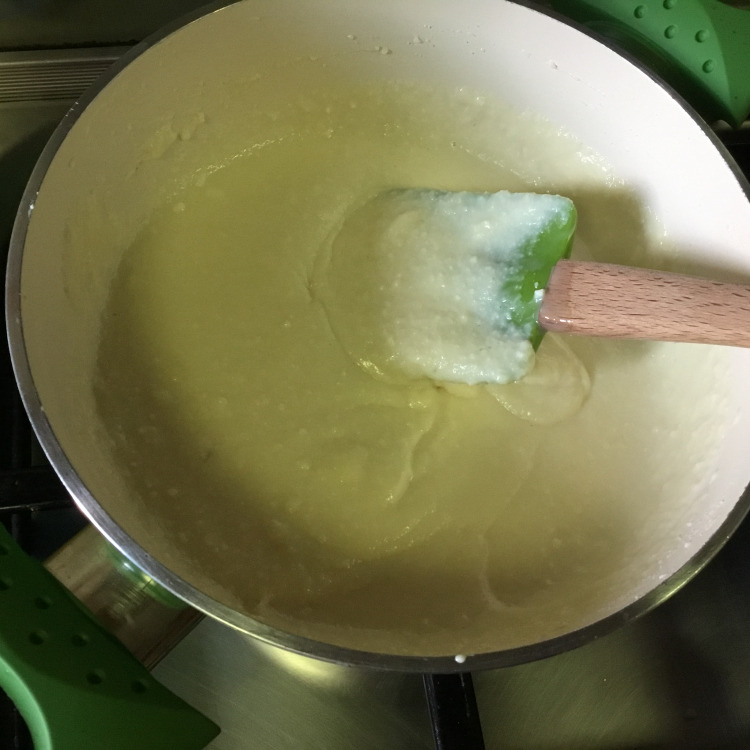 Alternately you can remove excess whey by pressing gently with the back of the ladle if using a sieve. Leave it for 20-30 mins. 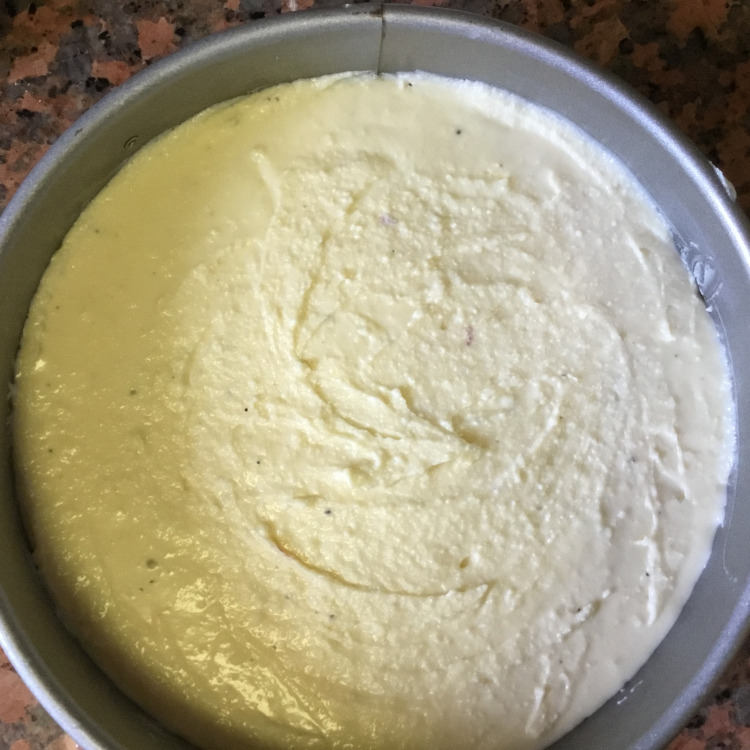 After that remove the paneer.The paneer you get will be crumbly and slightly dry and yet a little moist. Rub this paneer with your fingers to break all the lumps. You can use Store bought paneer too. But make sure its fresh and without any salt. Start by crushing the biscuits to crumbs. 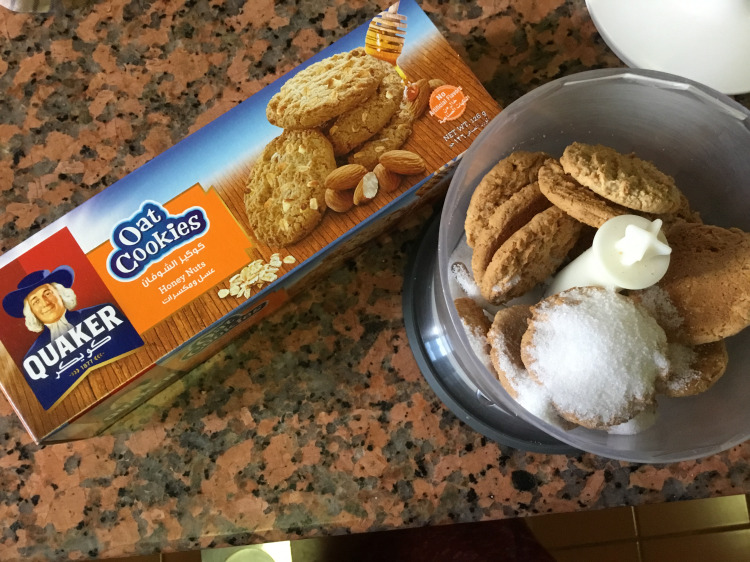 I made crumbs by pulsing the biscuits in the hand blender's jar attachment until finely grounded. Put in a large bowl, and stir in the sugar. Next add melted butter and give it a good mix. Press firmly the crumb mixture onto the bottom of a 9-inch springform pan to an even base. Keep it in the fridge for 1-2 hours to set. Meanwhile lets make the Cheesecake. 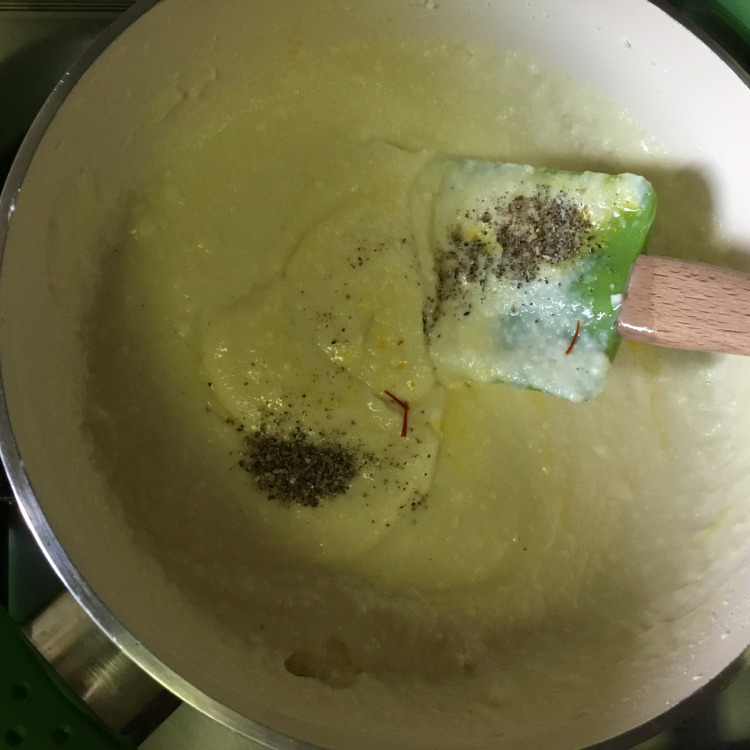 In a pan put the crumbled paneer along with the condensed milk and put on low heat. Keep stirring and mixing it. Otherwise it'll stick to the bottom of the pan. 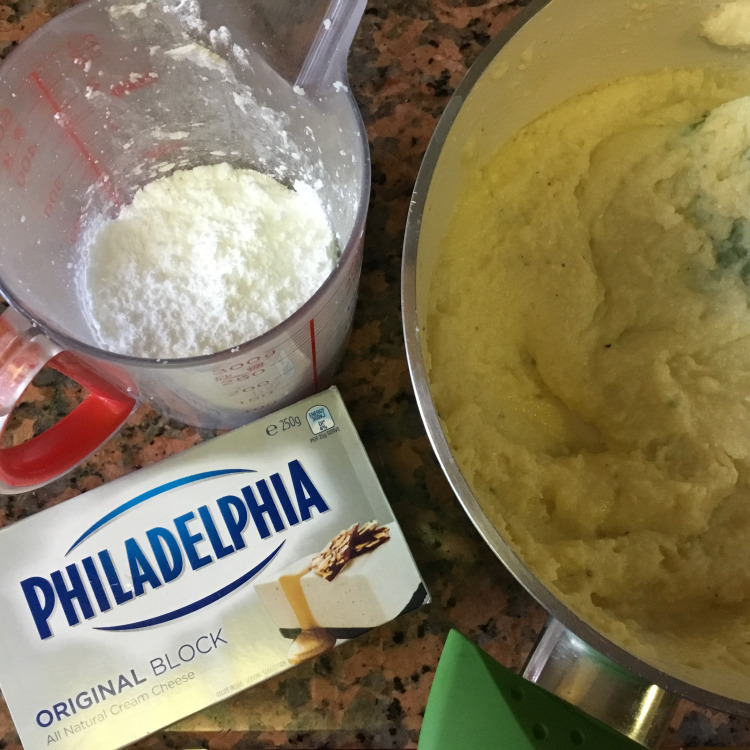 Keep stirring for 5-6 minutes, until paneer and condensed milk are well blended. Add cardamom seeds and saffron. Cook for another 2-3 minutes while stirring. Keep it aside and let it come to room temperature. After that in a bowl add Cream cheese and icing sugar. 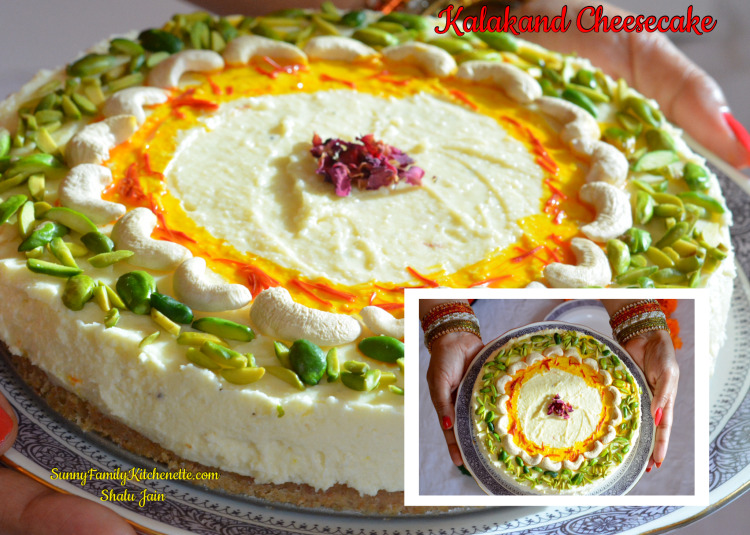 Add the cooled down kalakand to this cream cheese mix. Pour it over biscuit crust base. Keep it again in the fridge for 4-5 hours to set completely. Garnish with slivers of pistas and cashews and saffron. 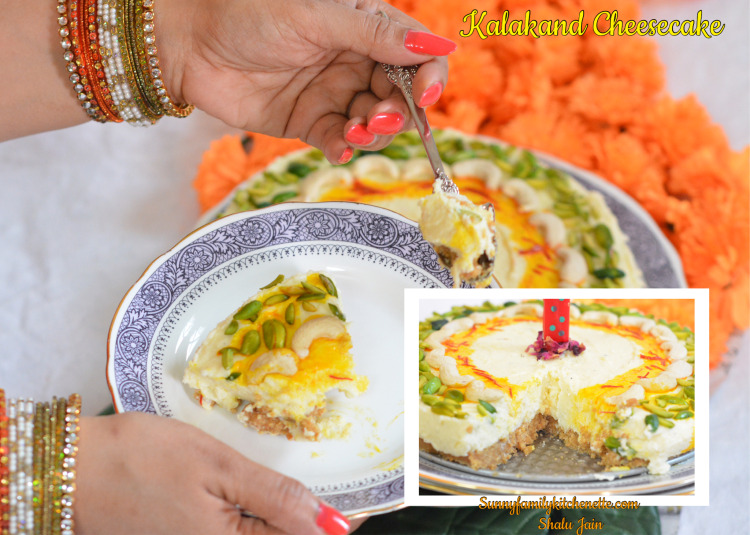 Enjoy the yumm kalakand cheesecake!! !